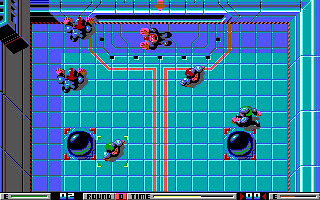 Speedball was developed by Bitmap Brothers, the developer of the popular Shoot'em Up Xenon 2. 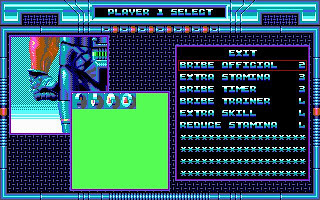 It has beautifully optimized EGA graphics that in my opinion is very good for a 16-color graphics. It support only PC Speaker though. 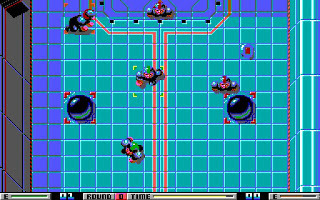 Speedball is a ruthless sport games that encourage us to use various dirty tactics in order to win the game. The rule for Speedball is simple. We need to shoot a metal ball into our opponent goal gate to get point. And this is the only rule. We can play the game with computer opponent or human player. Play with a human opponent of course is much more excited and intense. 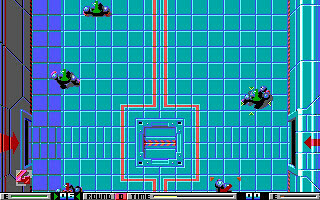 I still remember the fun moment when I play Speedball with my brother! During the game, we can collect various bonuses like coins that we can use to purchase item after a game and some power-up. The power-up will give us a few seconds boost on our speed, slow opponents or change the ball to a fiery one. The coins that we collect, we can use them to bribe referee, slow down opponents or increase our stamina. 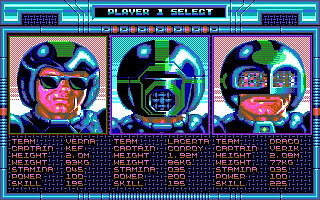 In conclusion, Speedball is a fun and exciting sport games that you can spend time with your friend. I strongly recommend this. 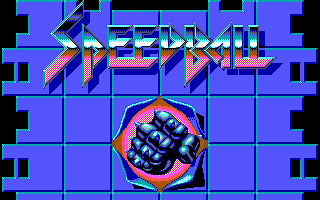 You can download Speedball here.